If you're in Ratnagiri, I'd recommend visiting Thibaw Palace. It has an interesting chequered history and the little museum on the grounds is an absolute gem. Thibaw Palace was built by the British during 1910 – 1911 for the last king and queen of Burma (Myanmar) who were in exile. The Thibaw Palace was occupied by the Burmese royal family until the king's death in 1916. His tomb is still preserved here. The route from Ratnagiri is a religious trip with numerous Ashrams at Pawas and beyond. I stop at all these ashrams. I have no conviction of my own, so I find it interesting to talk to people who have faith. This religious stretch cumulates in Adivare - famous for its Mahakali temple. 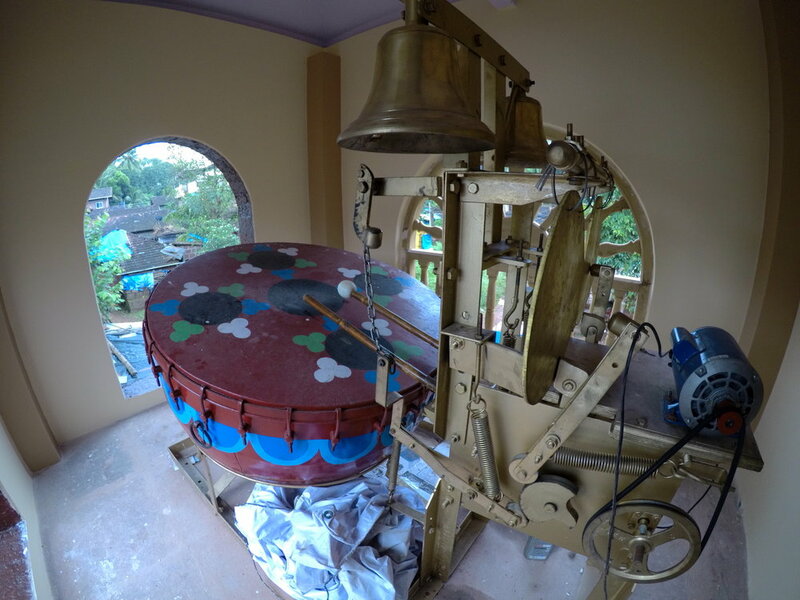 In the temple I see the most curious contraption I have ever seen on this trip - a machine powered ginormous drum! Super. On way to Adivare I meet an architect, Santosh, who is designing a beautiful Tawade community hall along the road. The building is a beautiful blend of modern and traditional and is constructed using locally sourced Basalt stone. Santosh is kind enough to send his driver to book a room for me at the temple dharamshala. This is the cleanest room I have stayed in - ₹ 300 only. Santosh also provides me with a reference to a lodge in Devgad (my destination for tomorrow). Dinner is a plain veg thali at the only restaurant in town and a few packets of knick-knacks for the night. I am up at 0500 and decide to start before the sunrise. This turns out to be a blessing, as watching the mist lift off the lush green Ghats is a sight to behold. I have my route broken into three segments based on the three bridges I have to cross today. As I approach the second bridge, I am told the bridge is under repair and I will have to go further inland on an alternate route. As we sit discussing route possibilities, a State Roadways bus makes a detour and comes to a screeching halt beside me. The driver leans out and tells me that taking the bicycle over the broken bridge is possible. I am thankful to this driver, whose name I didn't catch, and he went out of his way to save me a lengthy detour. I am in love with Devgad town. It is a low-key tourist destination. The beach is a beautiful cove with white sand and lovely breakers. I sit along the Enron windmill plant watching the sunset over Devgad beach, when a reporter from a Marathi daily approaches me. Now, I don't speak more than 3 words of Marathi and he doesn't speak a word of Hindi or English. So between the two of us and a gaggle of onlookers, I explain what the 100BeachRide is all about. He is busy taking notes and obsessively photographing me on the fatbike. I don't know why he would be interested in "just another cyclist" and a sceptical me starts to look for dinner at Hotel Prapanch. The locals have assured me this is the best local restaurant in town. I wake up with a slight pain in my already knackered knee and therefore today will be an easy day. The road from Devgad to Kunkeshwar is simply breathtaking. Palms, windmills, sandy inviting beaches and lush greenery. When I reach Kunkeshwar, a mere 13 kilometres away, I decide to call it a day. I spend the day gallivanting and exploring these beautiful beaches on an unladen bicycle. The priest at Kunkeshwar's famous Shiva temple sees me and beckons me in for a special puja. Apparently, my face is plastered across 3 local newspapers today and I am a local celebrity. The lunch home posts their son to keep a watch over my bicycle as I regale them with tales of my journey. Everyone wants a photo of me and the bicycle. More bicycle than me. The fatbike makes new fans all across the town. Everyone from the priests to the fisherwomen wants a ride. Overnight at Bhakt (Devotee) Niwas (House). Although I am an agnostic (which is different from an atheist), the ₹ 500 / night is a good deal. There is a key distinction. An atheist doesn’t believe in a god or divine being. The word originates with the Greek 'atheos', which is built from the roots a-“without” + theos “a god”. However, an agnostic neither believes nor disbelieves in a god or religious doctrine. Agnostics assert that it’s impossible for human beings to know anything about how the universe was created and if divine beings exist. I am hyper excited today. Malvan is my favourite destination along the Konkan coast. For me, Malvan epitomises the ideal seaside town - friendly people, interesting architecture, some history, excellent food and a general laid-back vibe. My celebrity status is apparent as I start off. The first shop I stop at for chai and vada pao, I am mobbed for photos. The woman running the shop calls more people on the telephone. Selfies galore and the fatbike gets inspected from tyres to the cockpit. I find I prefer anonymity to fame and profess a lack of time and head off waving to a large crowd. Just before Malvan, I am flagged by a person standing on the road. He runs a licenced "Maadi" (Palm Wine) shop and has heard the news on the phone. He insists I try a fresh batch he's just prepared and I am a sucker for this local drink. So a short stopover stretches to an hour. A few locals join us and many a toasts later I realise that even the fresh brew does get you high after 4 glasses. Another hour passes as I chat up the locals waiting for the "high" to subside and then I'm back on the road, pedalling with an extra gusto to Malvan. Malvan is the same as I've left it in 2015 which is a good thing. I make my way to Chiwla Beach and then it's hammock time, sipping a complimentary well beaten, sugar infused coffee at Rosary House. Hey, better milk the celebrity status if it gets me free Maadi and Coffee. I spend 3 days in Malvan cycling to every nook and corner of this town, exploring the church, doing the touristy things. My lunch and dinner is seafood at the ever-excellent Athithi Bamboo, who make it a point to cook fresh catch for me that are not on the menu! Ah, Malvan! You're the reason why I came to Konkan and I have never had seafood like this even in Europe or Africa.